44" high ?? Can't be. Maybe 34". The height of the brick bases from the porch that is. Sorry for the confusion. Thank you for answering so many questions! The house is absolutely gorgeous. Beautiful execution! Love all of your double hung windows. What is the size of the two smaller windows on the top right? Beautiful home! Can you please tell me what the trim and siding color - I would greatly appreciate if you could share with me. We are building a home some. Thank you! The colors were chosen by an interior designer. Those colors do not typically come across my desk, and even more rarely do they end up in a file. I know that's frustrating. Sorry, guys. Who was the interior designer please? Thank You Kozymomo - I adore these colors. Thank you Gardenbuilder. I appreciate the positive feedback. Beautiful! Can you share what the heated square footage is? Thank you! Interesting railing - Love the wraparound porch railing. Where is it from? The porch railing is custom made from treated lumber. Siding make and color? - Could you please tell us siding make and color? Yes, please post paint colors of siding and trim. Thank you very much. we no longer have record of these color selections. I do not recommend getting colors off of websites. Most photos, ours included, have been modified for optimal appearance, which can distort the color. Best of luck to you. Could you tell me the brick color? Beautiful home! 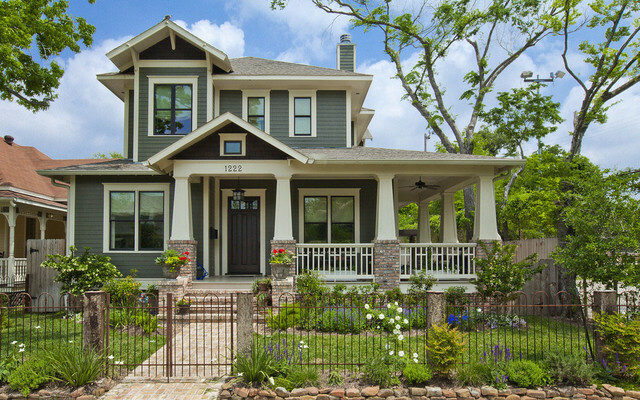 Hi, could you tell me the width of the half-height columns on the porch (smallest width and largest width)? Can we purchase rights to use this image? - I love this house and we would be interested in buying the rights to use the image for brochures and other marketing pieces. Can you sell the rights or put me in touch with the photographer? Thanks! I'm curious why you would want the house in brochures + marketing. Are you copying the house? No. We wanted to use it as the beauty shot on our trim board brochure. Love this house! - Doing a complete rehab on a house now ($2600 cost) almost identical to this house. Would like to know if there is a floor plan or "rough layout"for the upstairs?? Thanks in advance!! Jay, you're doing a remodel for $2600?!? That sounds pretty cheap. Congrats. We do not publish floor plans for our houses in an effort to protect the intellectual property rights of the creator. This house has 3 bedrooms, 2 bath, utility, desk nook upstairs. Thank you for engaging with us and reviewing our portfolio. no I am sorry. We purchased the property for this amount! That is how bad it is. thanks! Columns? - What are the dimensions of the columns and the stone bases? They are georgeous. If I remember correctly, these column bases are around 22" wide. The fencing is so unique and looks vintage. Who can I get to build me a fence like that in Clearwater, Florida? The client had it made. It uses old railway ties. They hired a regular iron fence guy to handle it. Thank you for asking. Good luck. I agree completely with this comment. I would love to know all the details! This is a custom home that is approximately 3100 s.f. in Houston, TX. There are more photos of this house on Houzz. We are not providing any specification information as it is a private residence. Thank you very much for our interest. I hope you find the rest of our work as enjoyable. Exterior brick - Love the siding and brick color combo. Can you tell me the color name of the brick? Or at least how to describe it to him? brick is Old Chicago reclaimed brick. Window sills are purchased from the window manufacturer and sent out in 12' lengths (I believe) with the windows. The framer then cuts them to size. Thanks for asking. Windows! - Love these windows, color, grid, casing. What brand or where can they be found? These are Jeld Wen wood windows. The casing is applied on site, probably a 1x4 with the typical craftsman header. thanks for asking. Gorgeous! Square footage - Beautiful home! What is the total above ground square footage?? Any additional photos of the entry?? Thank you! Thanks. This house is about 3200 s.f. The brick is 24" wide. Paint question - I love the black cedar in the sofit area. Can you tell me is it actually black? What kind of paint did you use in this area? This is not something that is seen very often. You did a amazing job! thank you for the kind words. This stain is mostly black, but it's got a little brown indiscernible in the photograph. Thanks again. House color? - Hi-I am very interested in the paint color of this home. It's a beautiful color. Would you mind sharing? Thank you. Sorry, we do not have the house color on file any more. Please be careful of getting specific color names from online sources like Houzz. I know that OUR photos have been "retouched" or "edited" which often distorts the color bit. I know MOST photos you see online are going to be that way. Best of luck to you. Beautiful House! What are the dimensions fo the columns and base? Fence - Sorry I know it's not about the house, but can you tell me about the front fence? What was used for the posts? Where was the ironwork sourced? The client had it custom made. The posts are old railroad ties. Width of home - Hi! Culd you share the lot size on which this was built and the width of the home? Thanks! Porch size? - The Front porch looks like the perfect depth, was wondering if you remembered the depth of it?...and is the same on the front and side? Thanks!! The front and the sides are not the same. The front is about 7'. The side is really more for side courtyard (not shown) access and is only about 4' clear between the columns and the wall. Window trim? - Are the windows trimmed out with black moulding or is it the window vinyl color? The windows are a charcoal color paint. They are wood windows, not vinyl. PLEASE tell us the color of the siding and trim. It is lovely. I no longer have those colors on file. I'm sorry. Good luck. It was purchased from Bison building supply, a local lumber yard in Houston. They sell several types of doors like this. Roofing and exterior? - What is the roof made from? Slate tiles? Also what is on the exterior of the house (walls)? Is it some type of nutec wooden panels then painted over in the respective 'grey colour'? Does this board deal well with weather on outside or is painted plaster or brick for a house better? The roof is typical composition shingles, found extensively throught out the US. The walls are cementitious siding from James Hardie (US national brand). It paints easily, and it lasts a long time, longer than unmaintained stucco but not as long as brick with is pretty maintenance free. It does need to be repainted ever 5-10 years depending on your climate. I do not have the colors for any of my houses. Be careful trying to match a photo. Many (mine included) have been enhanced by photoshop and the true color will be somewhat different from what you see on your computer screen. Thank you for asking. Dark window frames with minimal exposure so able to pull off contrasting trim. Overall good scheme.